Jesus, speaking to His followers, encourages them to continue persevering in the face of opposition. "you believe God, you also believe in Me" or "believe God, believe also in me." or any combination of these two. Either way the practical outcome is similar, Jesus is emphasizing the importance of His followers believing His promise. "In My Father’s house are many mansions"
The Greek monē (μονή) means abiding places; when translated to Latin the word used was mansio, which, like the Greek, is not attached to size or pretentiousness. However, the Latin mansio has been translated into mansion in the NKJV and the word mansion currently carries a certain image of excessive size and extravagance that was not intended in the original text. You can see a comparison of different translations here. The main idea, once again, remains the same, there will be plenty of room for everyone, and I am sure the abiding places will be perfect! I just wanted to clarify that the original text does not convey the modern idea of mansions. If this was not the case Jesus would have clarified it. He will go to prepare a place for us and He will come again! "I will come again and receive you to Myself; that where I am, there you may be also." Ultimately, Jesus wants to be with us! It has been His desire since the beginning. Paul puts together a great argument for the resurrection in 1 Corinthians 15, linking it not only to Jesus' resurrection but especially to the resurrection of the believers at the second coming. I would recommend you read the entire chapter but these few verses give you the gist of Paul's message. Jesus resurrection is the assurance we have of the resurrection of the saints during Christ's second coming. Paul encourages the believers to comfort one another with the words that Jesus is coming again and that when He comes He will raise the dead who died believing in Him. Ultimately "we shall always be with the Lord." God's desire is for us to be with Him forever and that is ultimately why Jesus is coming again. We comfort each other with this message and we look forward to the second coming of Jesus. If Jesus came the first time, to be born as a baby in a stable and placed in a manger. If He lived as one of us, suffering hunger, betrayal, pain and death. Will He not come the second time to defeat death once and for all? To establish His kingdom which shall never end? Jesus came and did everything He could to save us. He made salvation available to all for free. Free for us, He paid the price. What are we willing to do for our God? 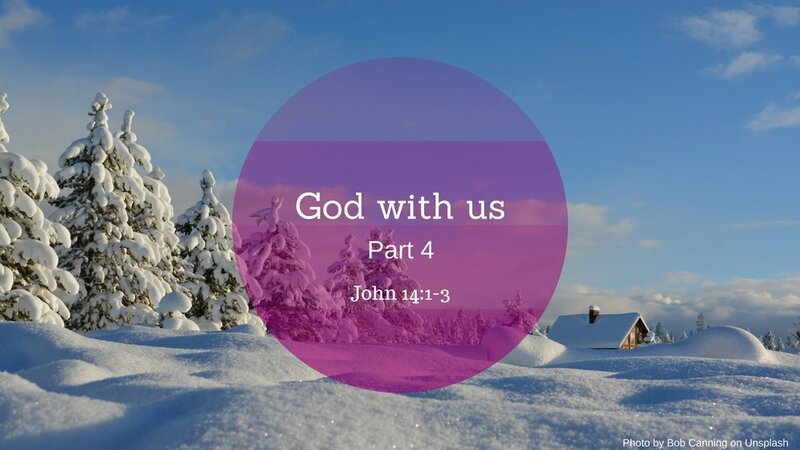 I hope that God’s desire to be with us, to be with you, has become abundantly clear to all of you in this series. I pray that we can all begin the next year with a renewed commitment to God. With a greater desire to spend time with God daily. To put aside distractions and any sin that might entangle us on our spiritual journey. God has done His part, will you do yours? Will accept Jesus anew into your heart? Will you allow Him to be you Lord and Savior? Will you allow Jesus to lead your life? Will you follow Him, and obey? There are many things in life I am unsure of, but the second coming is not one of them. If there is one thing I am sure of, its that Jesus is coming again! Allow me to close with the following words.